I hear that Leprechauns attract other Leprechauns… If that’s true then these cuties will surely help your little ones catch a lucky fellow who can lead you to his pot of gold… To make these I traced some shapes for my kids to cut out… Black triangle shoes, white rectangle legs, green rectangle bloomers, yellow rectangle shirt with black rectangle belts, yellow rectangle sleeves, white rectangle arms, white face, green hat. 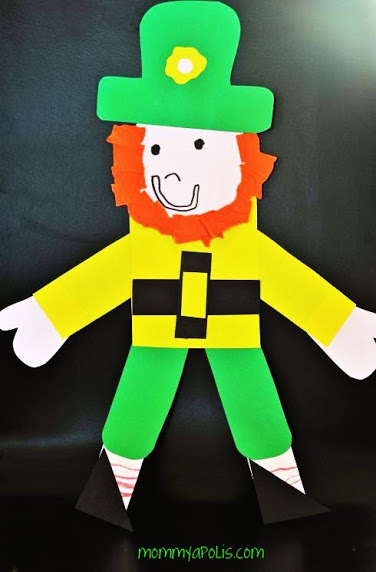 I let them cut out all their pieces, draw their faces and socks, we used ripped paper to make the beard, and they drew their own flowers for the hats… They were very easy to make and the kids had a lot of fun making them! Maybe we’ll see you at that pot of gold! ← I Love You the MOOSED!